Musheer Hussain, Edward Fisher, Jonathan Fishman,	The Journal of Laryngology & Otology, Volume 132 Issue 5, p 377. Y Kamhieh, H Fox, E Hallett, S Berry,	The Journal of Laryngology & Otology, Volume 132 Issue 5, pp 380-384. A Habib,	The Journal of Laryngology & Otology, Volume 132 Issue 5, pp 385-400. I Todt, P Mittmann, A Ernst, S Mutze, G Rademacher,	The Journal of Laryngology & Otology, Volume 132 Issue 5, pp 401-403. 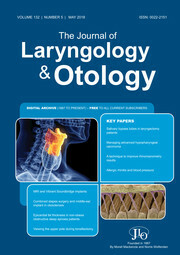 F Arslan, Ü Yıldızoğlu, A Durmaz, S Çetinkaya,	The Journal of Laryngology & Otology, Volume 132 Issue 5, pp 404-407. K Tsuzuki, K Hashimoto, K Okazaki, M Sakagami,	The Journal of Laryngology & Otology, Volume 132 Issue 5, pp 408-417. O Sakallioglu, C Polat, A Akyigit, H Cetiner, S Duzer,	The Journal of Laryngology & Otology, Volume 132 Issue 5, pp 418-422. E Eviatar, Y Golan, H Gavriel,	The Journal of Laryngology & Otology, Volume 132 Issue 5, pp 423-428. A S Harris, R G Thomas, C D Passant,	The Journal of Laryngology & Otology, Volume 132 Issue 5, pp 429-433. P Fingland, V Carswell, T Tikka, C M Douglas, J Montgomery,	The Journal of Laryngology & Otology, Volume 132 Issue 5, pp 434-438. S Derin, I Altun, S Koseoglu, C Sahin, M Yilmaz, F Akin, M Sahan,	The Journal of Laryngology & Otology, Volume 132 Issue 5, pp 439-445. A Cakir Cetin, E Dogan, H Ozay, O Kumus, T K Erdag, N Karabay, S Sarioglu, A O Ikiz,	The Journal of Laryngology & Otology, Volume 132 Issue 5, pp 446-451. H H Ching, A G Spinner, N H Reeve, R C Wang,	The Journal of Laryngology & Otology, Volume 132 Issue 5, pp 452-456. H R F Powell, I Pai, H Ghulam, D Jiang,	The Journal of Laryngology & Otology, Volume 132 Issue 5, pp 457-460. H Walijee, M Krishnan, R Sharma, S De,	The Journal of Laryngology & Otology, Volume 132 Issue 5, pp 461-462.